This news release from Immigration and Customs Enforcement is infuriating to say the least. While we can all applaud ICE for arresting this guy and getting him to plead guilty, there are some very troubling aspects about Naif Abdulaziz M. Alfallaj’s stay in America and potential sentencing. Alfallaj was only discovered because of a fingerprint found on a counterterrorism raid in Afghanistan that tied him to an Al Qaeda training camp. That was a stroke of luck because Alfallaj entered the U.S. way back in 2011. In other words, a Saudi citizen who attended an Al Qaeda training camp in Afghanistan was able to enter the U.S. on a nonimmigrant visa because his wife had status as a foreign student. And he walked around America freely until February 2018. But that’s not all…get this…he used his visa to enroll in a private flight school in Oklahoma. The potential sentencing of Alfallaj is a problem as well. The maximum sentence for visa fraud is just 10 years. The maximum sentence for making a false statement involving international terrorism is just 8 years. It’s hard to believe that a guy who attended an Al Qaeda training camp will emerge from a US prison with anything other than hatred for America. The ICE press release indicates that he will have to leave the country when his prison sentence is done. That likely means that a hardened Jihadi with a particular hatred for America, as well as experience inside American culture, will be at large somewhere in the world down the road. Maybe that’s why we were putting these monsters in Gitmo in the first place. OKLAHOMA CITY — A man from Saudi Arabia who is a former resident of Weatherford, Oklahoma, pleaded guilty Friday to visa fraud and making a false statement to the FBI by, among other things, concealing his application to and attendance at an al Qaeda training camp in Afghanistan in late 2000. This guilty plea was announced by the following agency heads: Assistant Attorney General for National Security John C. Demers, First Assistant U.S. Attorney Robert J. Troester of the Western District of Oklahoma, and Special Agent in Charge Kathryn Peterson of the FBI’s Oklahoma City Division. This case resulted from an investigation by the FBI Joint Terrorism Task Force, which includes members from the following agencies: U.S. Immigration and Customs Enforcement’s (ICE) Homeland Security Investigations (HSI), U.S. Secret Service, Transportation Security Administration, Oklahoma Highway Patrol, University of Oklahoma Police Department, Oklahoma City Police Department, and Edmond (Oklahoma) Police Department. “This investigation highlights the ongoing, coordinated efforts of the FBI and the Joint Terrorism Task Force to protect and defend the American people against any potential acts of terror,” said Kathryn Peterson, special agent in charge of the FBI’s Oklahoma City Division. On Feb. 5, 2018, Naif Abdulaziz M. Alfallaj, 35, a citizen of Saudi Arabia, was taken into custody by the FBI without incident, based on a criminal complaint signed in the Western District of Oklahoma. According to the complaint, the FBI found 15 of Alfallaj’s fingerprints on an application to an al Qaeda training camp, known as al Farooq, which was one of al Qaeda’s key training sites in Afghanistan. The document was recovered by the U.S. military from an al Qaeda safe house in Afghanistan. The document is also alleged to include an emergency contact number associated with Alfallaj’s father in Saudi Arabia. Alfallaj is alleged to have first entered the U.S. in late 2011 on a nonimmigrant visa based on his wife’s status as a foreign student. According to the complaint, he answered several questions on his visa application falsely, including whether he had ever supported terrorists or terrorist organizations. Alfallaj has been detained in federal custody since his Feb. 5 arrest. On Feb. 6, a grand jury returned a three-count indictment against Alfallaj. The indictment charged two counts of visa fraud. Count One alleged that from March 2012 to the present, Alfallaj possessed a visa obtained by fraud. Count Two alleged he used that visa in October 2016 to apply for lessons at a private flight school in Oklahoma. The third count charged him with making a false statement to the FBI involving an offense of international terrorism, when he denied ever having associated with anyone from a foreign terrorist group. At the Dec. 14 hearing, Alfallaj pleaded guilty to one count of visa fraud and one count of making a false statement to the FBI relating to international terrorism. In particular, he admitted he possessed a nonimmigrant visa from March 2012 to early 2018 that he obtained by fraud. He also admitted he falsely told agents during the December 2017 interview that he had never visited Afghanistan or participated in religious, tactical or military training outside Saudi Arabia; and he otherwise affirmed falsely that all of the answers on his nonimmigrant visa application were true and correct. Alfallaj faces up to 10 years in prison on the visa-fraud offense. He faces up to eight years in prison for making a false statement involving international terrorism. He could also be fined up to $250,000 on each count. As part of his plea agreement, Alfallaj consented to the entry of a stipulated judicial order of removal from the United States after he completes whatever prison term may be imposed. The Court will set a sentencing date in about 90 days. The maximum sentence is prescribed by Congress and is provided here for informational purposes. Any sentencing of the defendant will be determined by the court, based on the advisory Sentencing Guidelines and other statutory factors. Assistant U.S. Attorney Matt Dillon of the Western District of Oklahoma and Trial Attorney David C. Smith of the National Security Division’s Counterterrorism Section are prosecuting this case. 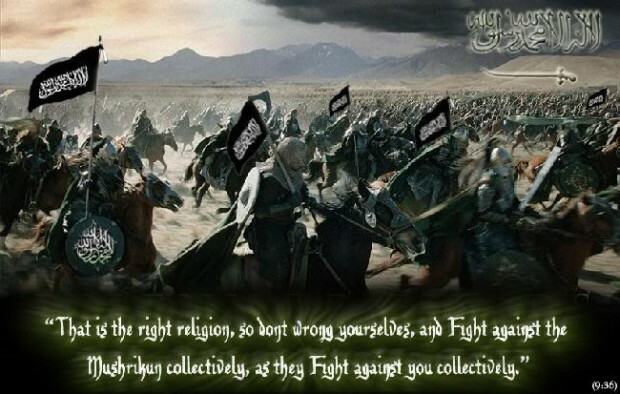 One of the most disheartening aspects of the war against Jihad is the parade of self-defeating and truly idiotic policies that Western nations have concocted while our heroic warriors and first responders attempt to defeat our enemies and defend us against their attacks. Here we have a prime example. A 37-year old German national who fought for the Taliban in Afghanistan from 2013 until February of this year, when he was captured by US and German special forces, has been convicted by a German court for being a member of a terrorist organization. So far so good, but it gets bad from here. For this he gets 6 years in prison. German privacy laws forbid his full name being disclosed. In 6 years (or possibly even sooner) “Thomas K” will be released from prison and no one outside of German intelligence and criminal justice will have any idea who he is.